Crunching numbers is crucial when buying and funding a small business. These 7 business financing calculators offer the insight needed to help aspiring entrepreneurs assess the business they want to buy and select the right business funding method. If you’re in the process of buying a business, you know that research and due diligence play a significant part in the journey. Before making any decisions, it’s important to calculate which business opportunity has the highest chances of success and determine how you’ll finance your new venture. That’s why business financing calculators are an aspiring entrepreneur’s best friend. As you explore business funding options, it’s important to understand how each option will apply to your specific situation in the way of monthly payments, total costs, etc. The below calculators can help you understand how some of the most popular business financing techniques differ and estimate your monthly payment amounts, payment schedules and more so you can go in with your eyes wide open. 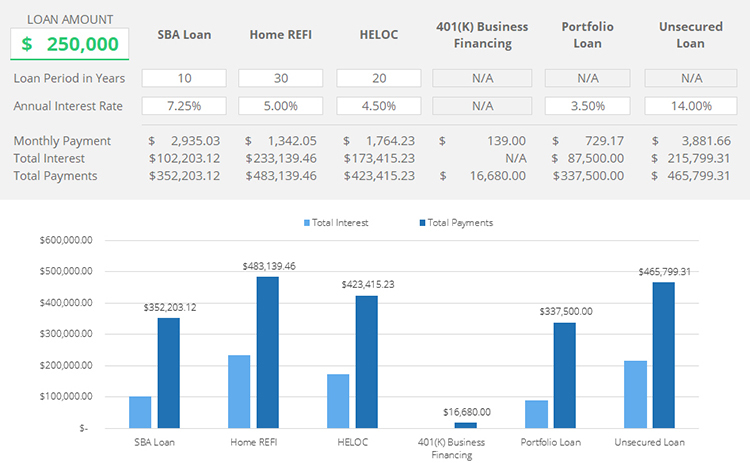 They also allow you to run multiple scenarios so you have see how different loan amounts, interest rates, etc. will impact your funding. One of the first steps in obtaining small business funding is to research all of your options and do a cost analysis to evaluate the short- and long-term expenses associated with each. Our cost of capital calculator offers visibility into the most popular business funding methods, including Small Business Administration loans, home equity lines of credit (HELOCs), home refinancing, unsecured loans, 401(k) business financing and portfolio loans. Simply enter your total loan amount and time period for the loan (if applicable), and you’ll see your estimated monthly payment amount, total interest accrued and how much you’ll end up paying over the duration of the loan. As you continue to narrow down which business financing solution is right for you, comparing your options is a beneficial way to weed out which ones are the most preferable. Our business loan comparison calculator makes it possible for you to run multiple loan scenarios side-by-side to see how different funding methods compare, including monthly payment amounts, interest accrued and the total cost of capital. The calculator also allows you to see the entire payment schedule for the duration of each financing solution. If you decide a business loan is the best route for your business, our simple business loan calculator will allow you to run scenarios to see how interest rates and the length of the loan can impact your monthly payment and the total carrying cost. This calculator can be used to simulate a wide range of loans, including SBA and unsecured loans, and even home equity lines of credit. Just input the desired loan amount, interest rate and the length of the loan to see your results. Some business financing techniques have higher repayment terms than others, so determining if and how much a business can afford in monthly payments is crucial to selecting the right funding solution. This business funding scenario calculator can help make that decision easier by analyzing a business’s recent performance to see how a monthly payment would affect net profits. It offers insight into two different types of funding options: traditional SBA loans, which require monthly interest payments, and 401(k) business financing, a debt-free option that involves only minimal monthly maintenance fees, so you can see how each technique affects the business’s bottom line. When selecting a funding method, you need to be sure that the business can cover any debt it takes on. Lenders use what’s called a ‘debt-service coverage ratio’ to determine if a business has the ability to successfully repay a loan, and our debt-service calculator allows you to determine this number on your own before applying for a loan. This calculator looks at a business’s past revenue and operating expenses to determine how a monthly loan payment would affect net profit, and then calculates the debt-service coverage ratio based on those numbers. Coverage ratio scores range from 1 – 4; the higher the score, the better the business’s ability to afford the debt. Outside of choosing the right financing option, evaluating the business you’d like to start or buy is an equally important part of the journey to entrepreneurship. Whether you want to start a new independent business or purchase an existing one, the below calculators can help you run scenarios to estimate the business’s ability to make a profit, as well as forecast growth. The million-dollar question all business owners want to know is “when will my business break even?” In other words, at what point will the business’s sales revenue outperform its expenses so it can start making a profit? Our break-even analysis calculator makes answering this question easier by evaluating a business’ sales, variable costs and fixed costs to calculate how many units must be sold to break-even. It also allows you to run different scenarios to see the impact on net profit, such as price per unit, sales commission, staff/admin costs, etc. If you decide you’d like to buy an existing business or franchise, part of your due diligence should include making sure the asking price of the business is fair. Our business valuation calculator can assist you in making this determination by evaluating the business’s current worth based on revenue, expenses, assets and more. Most of the numbers required in this calculator will be given to you by the business seller, or you can estimate based on what you do know. Making the leap into small business ownership is certainly a big decision that requires in-depth thought and research. However, these calculators can help support you as you do your due diligence to ensure the business and funding method you select will put you on the path to entrepreneurial success. Of course, it’s always best to talk to a professional about your specific situation when you’re ready to move forward. 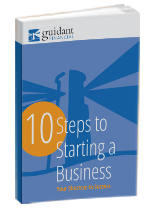 At Guidant Financial, our team of small business funding experts are ready to help assess your individual needs. Get pre-qualified for funding online or call us directly at 888.472.4455.